Pekin's are very skittish in nature and run away easily but they can't run very fast or far, making them pretty useless. Scare a Pekin enough and it may lay an egg in front of you. I don't know whether that is funny or creepy. Pekin's are not the best parents and often lose their young when running away from danger. Their feathers are the same as a normal chicken and they can fly but only sort distances. They prefer to use their feet to run away rather than flying to escape predators. Pekin's naturally eat worms and small insects but their favourite food is corn. They don't like being scared our of their wits from adventurers chasing them down for eggs. Pekin and their children the Pekly have been around for generations in the world of MEGA Craft (actual world name pending). They are the staple of any fair farm and provide good eggs and sometimes even their feathers can be useful. When cared for it is better not to bother them too much as they get easily stressed and disturbed. The Pekin was named due to it being the only thing the discoverer could think of when they saw it foraging on the ground. They have been this way for many generations and research has found they were likely not much different even in ancient times. Basically, another easy target for many generations although slightly more annoying to catch than a Moodle. A Pekin is an adult Pekly and the Pekly is the Pekin's child. Pekin and Pekly come from the Beginner Grasslands which your adventure starts in from my work in progress game MEGA Craft. The Grasslands are green with lush grass and small flowers with only a few small hills. A small river flows in the middle of the land splitting it into two. There are also some hidden grassy groves which creatures like to settle down in. The grassy groves are the Pekin's favourite spot to settle down in for shade, protection and to sleep in. They like because it is dark so predators find it hard to see them and so they feel safer. However, they fail to take into account the fact they also can't see very well in the dark. The Pekin is a little plump chicken which can come in either white or brown. The ones used in farms are often the white kind but the wild ones are often brown. Their brown feathers have yellow highlights in them but other than that are the same as a normal chicken and they can fly but only sort distances. They prefer to use their strong orange feet to run away rather than flying to escape predators. Male and Female Pekin look the same and both have the defining red crest on its head. 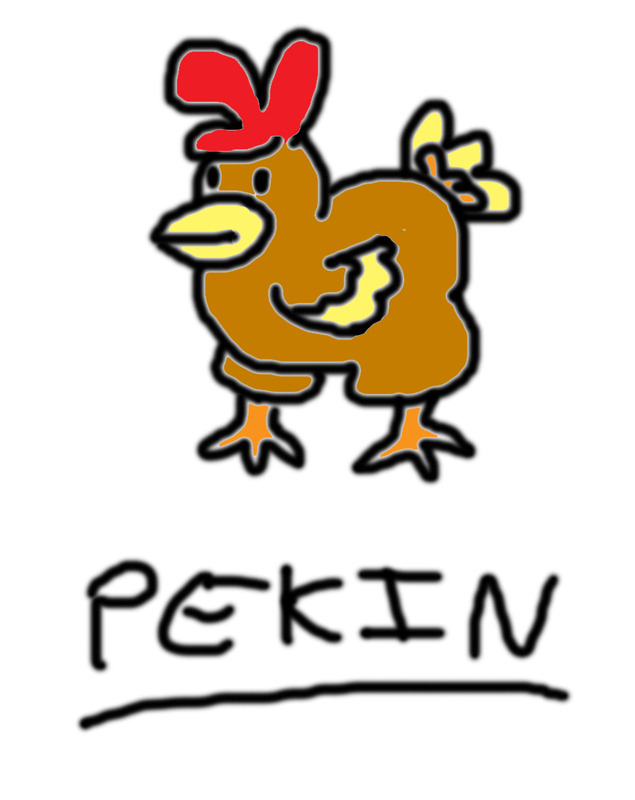 The Pekin is a chicken-like creature (basically it is a chicken) designed for my work in progress game MEGA Craft. This creature is an adult Pekly and they are useful for gathering eggs and simple feathers. It appears in the first area of the game called Beginner Grasslands and runs around skittishly with a few Pekly following close behind. They are a staple to any fair farm. For more details of the game such as location information then check out my Blog which may or may not have the same info as on here.